Michael Furie (Northern California) is the author of Spellcasting for Beginners, Supermarket Magic, Spellcasting: Beyond the Basics, and the forthcoming, Supermarket Sabbats published by Llewellyn Worldwide and has been a practicing Witch for over twenty years. An American Witch, he practices in the Irish tradition and is a priest of the Cailleach. His interests include writing (of course ;) ), reading, music, cooking, herbs and television. Musically, the artists Alanis Morissette, Fiona Apple, Stevie Nicks, Lady Gaga and Cyndi Lauper are most favored. Television interests included The Simpsons, The Golden Girls, 2 Broke Girls, Charmed, and the (former) soaps All My Children and One Life to Live. He began writing in 2006 and his first book was published under his Craft name, Blackthorn Furie. 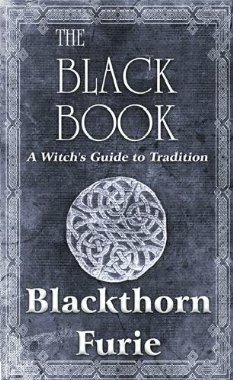 It is called, The Black Book: A Witch's Guide to Tradition and can be purchased at Barnes and Noble.com and Amazon.com. The Black Book is a brief overview of a version of Michael 'Blackthorn" Furie's personal Witchcraft practice. Being a Traditional Witch, this book encompasses only those teachings, rituals and magical styles associated with traditional Irish Witchcraft and particularly those related to The Cailleach. It is a brief yet thorough glimpse into his practice and includes rites for every holiday and major life event making it a well-rounded guide to The Craft. The book also goes deeper into the Witchcraft worldview covering such topics as the elements, "good" versus "evil", magical laws, life paths in The Craft and even the nature of The Gods. From the back cover-- If you have ever wondered not only what secrets are contained within a witch's religious tradition but also how to use these secrets to enrich your life and why they work, then this book is a must-read. In The Black Book, the author gives complete instruction in both learning and living the ways of the witch. Included are detailed sections covering sacred lore, religious training, Sabbat celebrations, life-transition rituals, divination techniques, the complete, unedited process of invocation, magical life paths and much, much more. The ancient traditions of the craft continue to be practiced in modern times and with the training in this book, you too can live the magic and walk the path of the witches.